1000lbs plus Sharks off Irelands West Coast! Well Paddy asked me to write an article on this fishing and as I agreed, here goes! Just to give some background to this; I worked as a commercial fisherman and I grew up fishing out of Donegal and then skippered a 60foot netter all along the west and south coast. Now I know a lot of anglers give off about commercial fisherman and I agree a lot of fisheries were miss managed but I disagree that this was just the fault of the fisherman at sea and by and large they are hard working men that supply a lovely lunch to the land lubbers! (I also agree and campaign that the bigger boats should not be allowed to fish close to the shore) However this experience growing up has given me the chance to see some mighty fish, fish that if caught on rod and line would be the talk of the angling world. 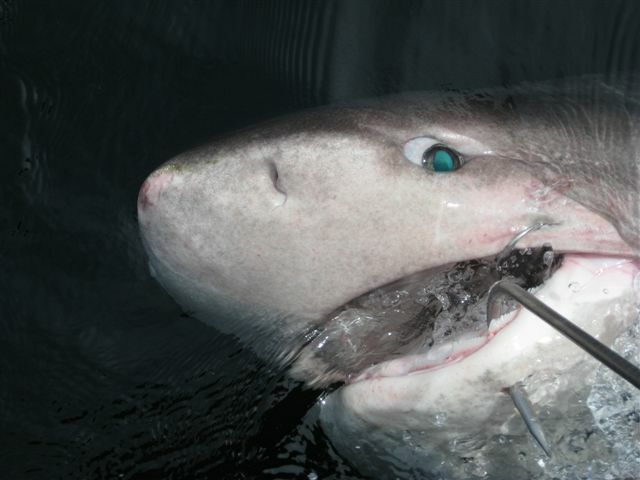 Porbeagle sharks over 500lbs, Skate over 300lbs, big Swordfish, Halibut, Six gills, Threshers, to name but a few. 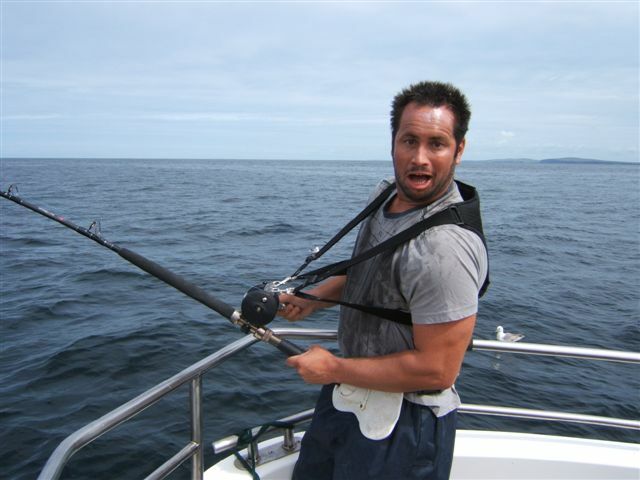 And not in the distant past, I was catching amazing fish like this up to 10 years ago when I decided to change to being a charter skipper. I was in the lucky position that I could get a new boat built for me to my specification and when ordering the rods I wanted, as well as the sporty 12 to 20lbs and the shark handling 30lbers I also got a set of heavy 80lb rods so if I did bump into some “big” fish my crews had a fighting chance. So here I was fishing away with my new boat and learning every day. I have a good idea where different fish hang out from my background but knew very little about angling. Lots of fishermen bring out there own rods and tackle and as you all know love talking about it! I would listen, but also come in with stories about the big fish I have seen and this would catch the imagination of some of the groups that came out. Every so often we would put aside some time to try out a patch of ground with heavy tackle and big baits. And we were having some luck with good sized Skate. Then after a couple of years and trying different marks, we got on a big fish, fought it for a while and then lost it. I knew from the sheer power that it was bigger than anything we had hooked up to date but it had made short work of the Skate trace I was using made up with a 2,5mm mono biting trace. Going on the assumption that whatever had done that had sharp teeth I added the strongest blue shark trace I had to the end of my Skate trace, baited up and sent it back down. We did not have to wait long for another take. This time we got a longer fight but again the trace came back with the wire shredded. That day we sent down about 5 traces each time doing our best to make as strong as possible and each time we were bested!! We did manage to keep it on for about 10 mins and the power was thrilling. Evening came and we headed back but the group were with me for a week and still had a couple of days left. The next day I had a trace made up with some break cable I had got my hands on but as the weather was not kind we could not fish the mark. But the next day was just grand and we headed straight to the mark. Within an hour of starting to fish we were in again and this time it was game on! We took a cautious approach and just applied as much pressure as we dared although as the fight went on we got more reckless, still it took and hour and a half of heavy pulling before we felt we were getting close to the trace. We still did not know what we were into but when we got the first sight of it under the boat, the shear size of it was amazing. 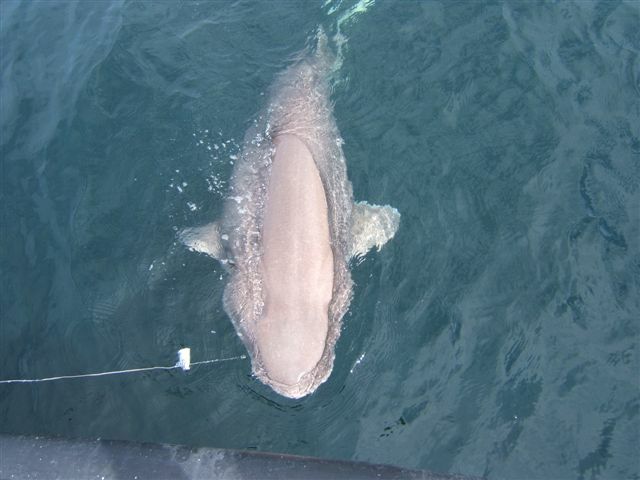 At the surface it was one big mother of a fish and I could indentify it as a Six Gill Shark. We got lots of photos and I knew it was heavy and most likely a record but we were happy to let it go. The boat was quiet that evening going in as we just looked at each other, shook our heads and smiled. I had made up picture with a few photos of this shark which we estimated at 300lbs and hung it on the wall in our guest house. The next year a group came in and one of them asked me about the Shark. He said if he got one he would be interested in getting it weighed. I laughed and said you will be lucky! But a few days into the trip we got the chance to try the mark again and much to my surprise we had a heavy fish on inside half an hour. An hour later we had it on the surface beside the boat and I was committed to taking it in. As we headed in I called someone I knew who was a fish merchant and asked if he could meet me at the pier with a forklift and if we could use his scales to weigh the shark. I also called someone I knew in a university to let him know that this fish was coming ashore. That was the start of some couple of days! When we got to the pier there was about 50 people there as word had got out about the “big” shark we were bringing in. As we took the Sixgill up the pier to the scales I knew it could go up to 500lbs and thought that would be plenty. As we lowered it onto them though it just maxed out. So the next step was a weigh bridge locally and it measured in kg’s. This Shark proved to be 480 kgs or 1056lbs and as I was to find out later the first rod caught Shark or fish over 1000lbs in this part of Europe. The next day as the media were getting to hear of it and my phone was ringing none stop with people asking about the catch, 5 scientists some of which had flown in especially did a post-mortem. I suppose I better address the catch and release debate at this stage! Coming from a commercial fishing background it was not uppermost on my mind as we brought in this shark. I have landed boxes and boxes of all types of fish and seen and know of many sharks that were released out of nets, some alive and some dead. To be pious about catch and release would be hypocritical of me. The scientist I rang were just delighted to get a fresh adult Six Gill to study and indeed sent me a letter to thank me. I have also had requests from them to bring in more. However as a rule from the day I started as a charter skipper I have taken part in the catch, tagging and release of Sharks and Tope, not out of some fanatical zeal as (some) anglers seem to, but because it has always been against my beliefs as a fisherman to waste fish and the information gathered from the tagging program run by IFI is most interesting. I am against taking undersized fish as well and indeed have got into trouble with some groups for insisting on putting back small Pollack and Cod. One thing I learned from bringing in that Sixgill was how hard it is the estimate the weight of a fish in the water if you have no reference. From then on we have tried out the “Sixgill mark” a few times every year. Not as often as you would think as you need a group that are interested in putting in the time and with only a couple of rods out. We have not hooked up on every try either! But we have had some continued success and hooked up a few times each year. 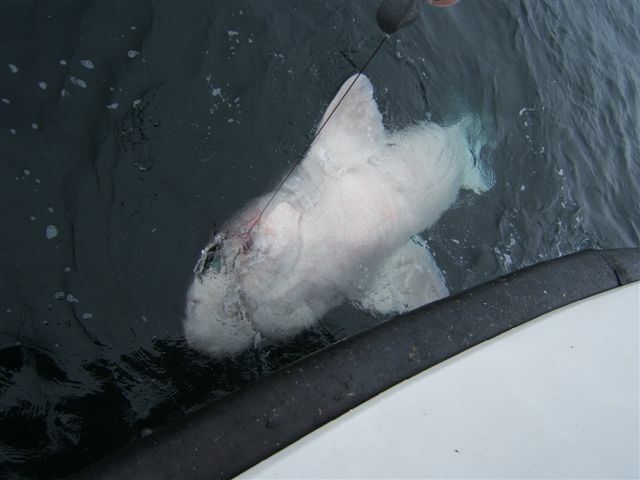 I would say about 1 in 3 hook ups result in a fish to the surface and last year we had 3 Sixgill Sharks by the boat. This year we had one that I would say was well over the 1200lbs mark and 5mtrs long to the boat. We have released them all, so I can’t give you definite weights!! 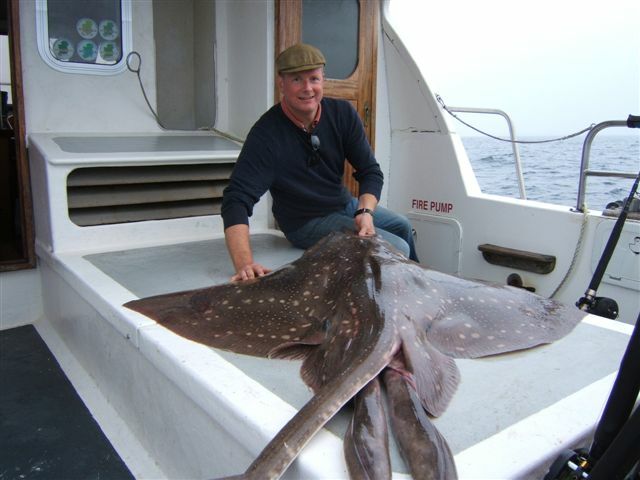 Lots of people have also talked about having a try at a Sixgill while here on their fishing holiday and we have had a go if the weather was right, but 2014 was the first year where a group of fisherman booked a few days to “go” fishing for Sixgill’s and I was delighted when day 2 resulted in two Skate over 100lbs and a Sixgill over 1000!!! I will finish up this with some comments on what I have found out about suitable rods, line and tackle: We have had one on a short stiff 30lb rod but have lost a few on longer 30 to 40lb rods as the angler was not able to put enough pressure on the fish. Indeed I saw a fight go on for 3 hours but still resulted in a lost fish. I would say the ideal rod would be a 6 to 7 foot 50 to 80lb rod. Again I have had them on Mono but as a rule because you are fishing on the bottom I have found braid best and I would recommend 80lb plus breaking. We continue to experiment with the terminal rig but at the moment I am very happy with a rig with 5mtrs of 2.5mm mono and 1mtr of 500lb wire terminating with a 12/0 or 14/0 heavy hook. I hope you have found this of some interest, thanks for reading and who knows maybe we will meet up some day on the Clare Dragoon! 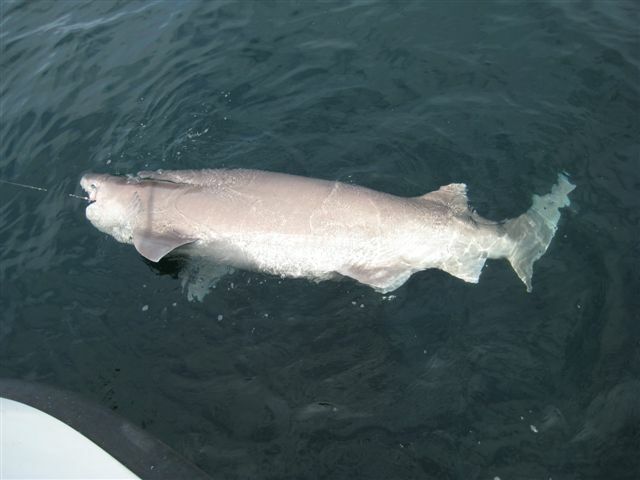 This entry was posted in Boat fishing and tagged Carrigaholt, Clare Dragoon, Luke Aston, six gilled shark. Bookmark the permalink.